Samsung Electronics Co. on Wednesday hosted an event to promote QLED 8K TVs in South Korea, claiming the product will set a new standard in the global market for premium TVs along with the microLED products. 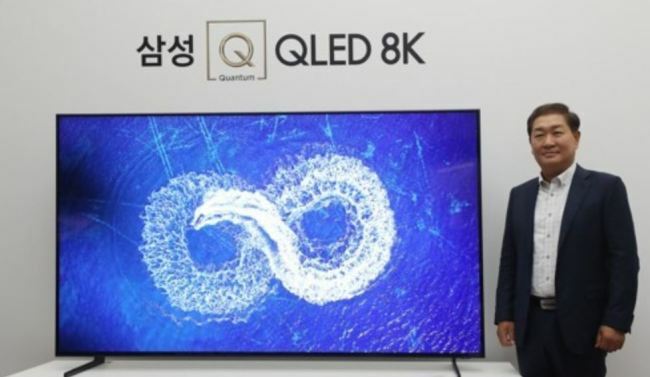 The event came after the company officially started the sales of its QLED 8K TVs this month, ranging from 65 inches to 85 inches in South Korea. The price ranges from 7.29 million won ($6,483) to 25.9 million won. The QLED 8K is one of Samsung Electronics' latest premium TVs. The tech giant has been promoting QLED TVs as their high-end products, which utilize quantum dot technology. Samsung said its 8K TVs will deliver screens four times as vivid compared to 4K counterparts. Samsung's smaller rival, LG Electronics Inc., on the other hand, utilizes OLED displays, which do not need a backlight, for its high-end TVs. The company said the QLED 8K boasts outstanding resolution and color based on the brightness of 4,000 nits. A nit is a unit of luminance equal to one candela per square meter. Samsung said the TV also supports High Dynamic Range content. HDR technology allows television screens to deliver vivid displays by optimizing brightness depending on color. Another significant feature of the QLED 8K is its Quantum Processor 8K, an artificial intelligence program that "recognizes and upscales the content to appear in 8K quality." Accordingly, Samsung's QLED 8K TVs will automatically upscale the quality of any video to 8K-level, alleviating criticism that there may not be much content that can be fully enjoyed through its high-end TVs. The company said it made efforts to reproduce 8K content as close to the real thing as possible. Its audio system optimizes the sound of programs depending on content, ranging from sports event to news reports, adjusting the sound of crowds or other background noises. The TVs are also suitable for playing high-resolution games as it can reduce lag and other disruptions. Installed with Samsung's Bixby AI program, users can activate the TVs with their voice and operate other home appliances connected to the Internet-of-Things network. Samsung Electronics said as the market's demand for larger TVs is quickly increasing, the need for top-notch resolution technologies to support the trend has become vital as well. "When a user watches (a video) through high-resolution displays, such as 8K, their brain recognizes them as actual objects," said Lee Kyoung-min, a professor of cognitive science at Seoul National University. The South Korean tech giant said it will take a two-track strategy for its premium portfolio to cover both QLED and microLED TVs. Samsung Electronics President Han Jong-hui said consumers mostly focused on models sized 75 inches and higher, although 65-inch versions are also popular in the European market. The company said the shipments of the QLED 8K TVs were 1.5 times higher than its expectation.